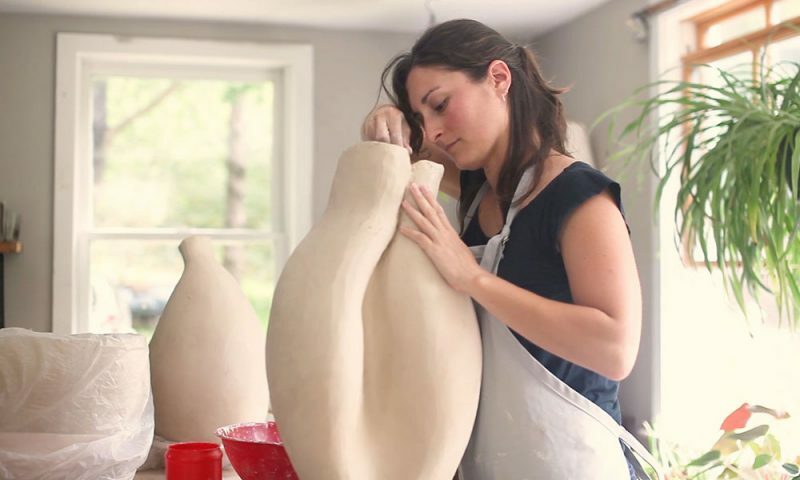 Potter and florist Kat Habib works on a large vessel at her studio in Sperryville. Most artists are struggling artists, one way or the other, but Kat Habib struggles mostly to find the time to be an artist. When she’s actually practicing art, hey — no problem. The Sperryville potter and florist is 33, one of Rappahannock County’s younger practicing artists. To meet the high cost of living in a magical, beautiful land where the sales of second homes nowadays outpace those of secondhand tractors, she works in a number of professions to be able to pursue the one that means most: hand-building both sculptural and functional works in clay. So she lends a hand, or usually two, on a regular basis to create special-occasion floral arrangements with Jen Perrot at Sperryville’s Flourish Root, which to Habib is yet another form of artistic expression. She works half the week as the Headwaters Foundation’s Next Step program coordinator at the high school, plus she’s a property manager and, in the summer, assistant director at Rappahannock Nature Camp. 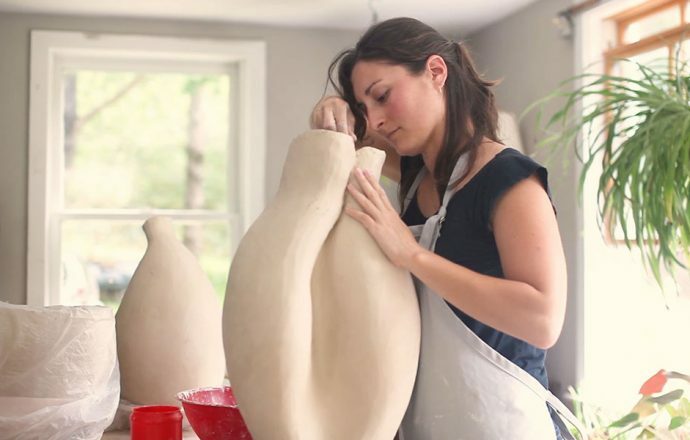 You can see Habib’s creative practice firsthand below, in the latest in a series of Artists of Rappahannock videos, completed in 2017 as part of a project funded by a Claudia Mitchell Arts Fund grant from the Rappahannock Association for Art and Community. A longer version of this article appeared in the Thursday, Jan. 11, 2018 edition of the Rappahannock News. marianne ross on Time for the Fall Art Tour (Video)! Sydney Frymire on Artists of Rappahannock video series: Launched! Time for the Fall Art Tour (Video)!